We all know the feeling of being stressed – of being pressured by our worries and responsibilities. It doesn't feel good, does it? While leaving our school projects and work assignments behind is not a recommended solution to stressful situations, having a short, relaxing break usually is. And we have just the thing for the case. 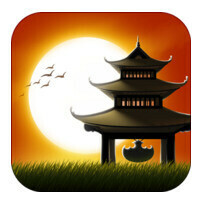 The apps we've picked are designed specifically to help you relax – to clear your mind, to take you to a happier place. They're also ideal for those times when you need to concentrate on your work or studies. In fact, we're using one of them as we write these very lines. How do these apps work? It's rather simple, actually – they use ambient sounds to virtually teleport you to a calm, peaceful environment. So, grab your earphones and get ready to switch to chill out mode. As soon as Calm is started, it takes you to the shore of a virtual lake, where the sound of birds and splashing waves keep you company. Dozens of other high-quality environments are available for download - the sound of rainfall or the beach, to give a couple of examples. The app also includes a step-by-step audio guide and introduction to meditation, the first few chapters of which are available for free. The cool thing about TaoMix is that you may compose your own blend of ambient sounds, hence the app's name. Or just tap a button to randomize the mix - the app will instantly create a random audio ambience for your listening pleasure. What's more, the position and level of each sound may be set to vary over time for a more pleasant experience. Over 40 high-quality sounds are available in the full version of TaoMix. Naturespace offers a collection of authentic recordings, all captured in a way that makes you feel as if you were at the recording's location. As long as you're using headphones, that is. Six of the tracks in the app's library come free of charge. The name of the app pretty much says it all. The next time you're having troubles concentrating or falling asleep, try listeing to one of the 36 high-quality ambient sounds included with Relax Melodies. Three binaural beat tunes are included as well. These are special sounds that attempt to stimulate your brain using specific sound frequencies. And this is Coffitivity. The app is made to help you concentrate by recreating the sounds from within a coffee shop. There are only three free sound loops to choose from, but they do get the job done. I'm a white noise diehard myself.